Himatangi Radio opened on 9 November [see video]. On Christmas Eve the station transmitted to London the Christmas speech by Queen Elizabeth II, who was visiting New Zealand. The speech was then broadcast to the Commonwealth via the BBC. 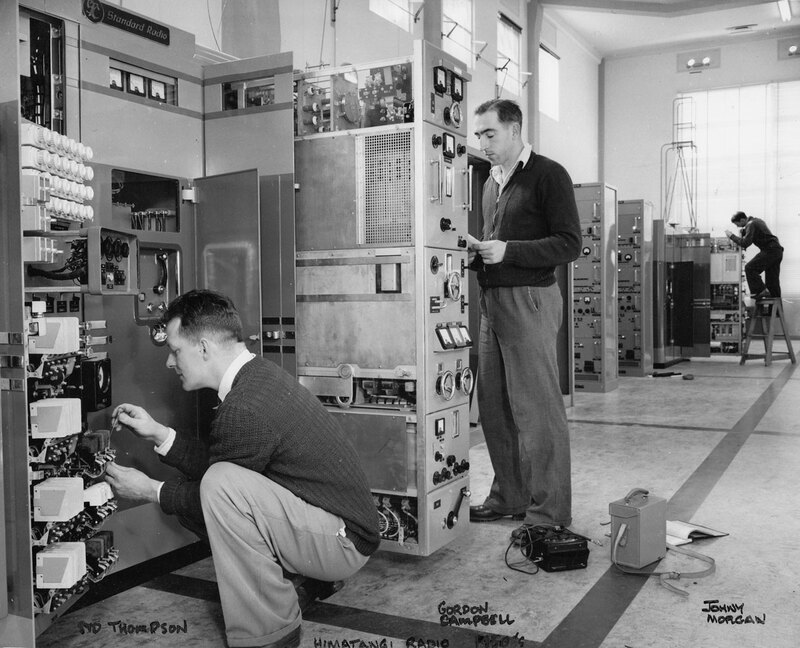 Syd Thompson and Gordon Campbell work on one of four STC DS-12 4.5kW transmitters during the 1950s. Johnny Morgan in the background. Courtesy Jon Asmus. Click to enlarge. The transmitter employed for the radiotelephone service to London was a Standard Telephones and Cables Limited (STC) Type DS13 with an output power of 40 kilowatts on radiated frequencies up to 22 MHz. If propagation conditions permitted the DS13 could provide a telephone transmission direct to London on what then became known as the longest direct HF radiotelephone service in the world. 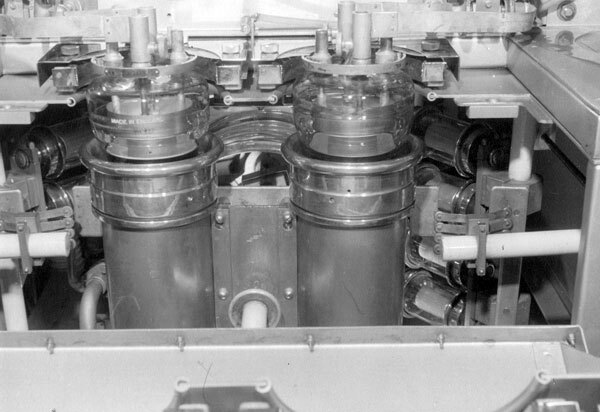 The final output valves of the DS13 transmitter, together with the final tuning coil, were water-cooled by means of distilled water being pumped through the valve water jackets and the hollow turns of the final tuning coil. 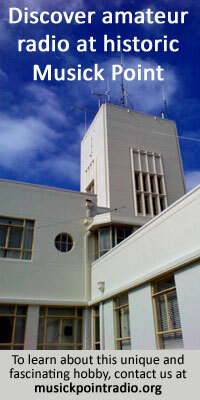 The heated water was returned to a cooling system at the rear of the transmitter comprising an air-cooled radiator and forced-air fan system. The supply voltages for the DS13 were 6000 volts at 1.2 amperes for the four-kilowatt driver stage and 11,000 volts as 6 amperes for the final amplifier stage. 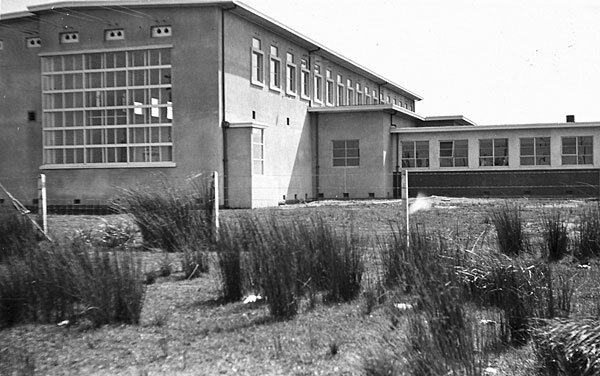 This London telephone transmitter occupied a considerable floor area as the internal units of transmitter equipment were all housed within a security locked “walk-in” enclosure. As a point of interest, the water distillation plant at Himatangi associated with the cooling systems of the two London transmitters was legally required to be registered as a ‘still’ with the New Zealand Customs Department. Main control console at Himatangi Radio. Date unknown. Courtesy Jon Asmus. Click to enlarge. 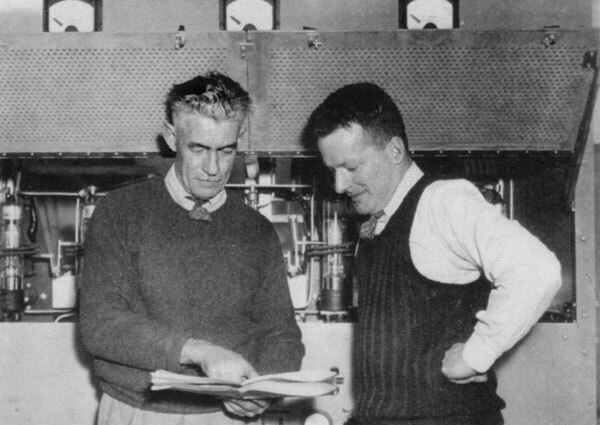 The Himatangi Radio control console was installed in a central position in the transmitting hall adjacent to the two London telephone and telegraph transmitters. It allowed the operating technician to gain instant access to the input line of each of the various transmitters as well as a sample of the radio frequency output from each transmitter – an essential feature when it came to circuit assessment or fault diagnosis. 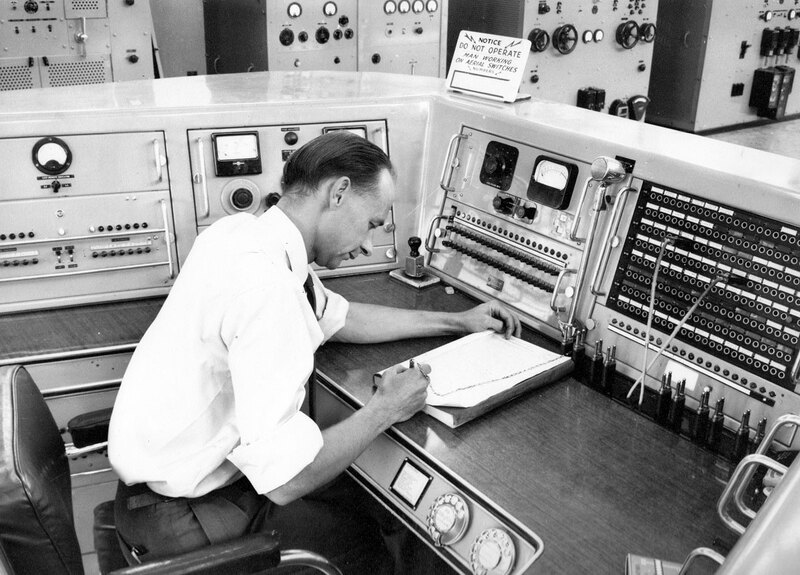 The above photograph shows the control console manned by a technician on shift duty. The jack field and drop cords allowed him access to the input traffic line to each transmitter while the adjacent volume indicator showed the input level of signal from the particular remote traffic terminal. The left hand units allowed a sample of the radio frequency output from each transmitter to be monitored for transmission quality and level. 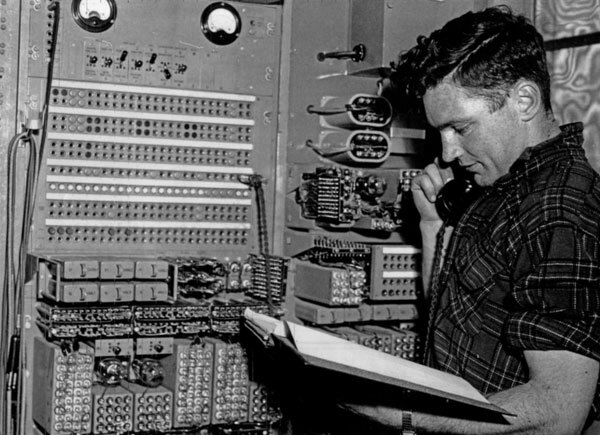 Two telephone dials allowed him access to the remote traffic terminals in Wellington and to the local PABX telephone exchange, while all circuit events were recorded in the station log book using world wide Greenwich Mean Time. In the background can be seen the individual cabinets of the 50 kilowatt London telegraph transmitter. A transmitter was installed for the new radiotelegraph and telephone service to Vancouver. 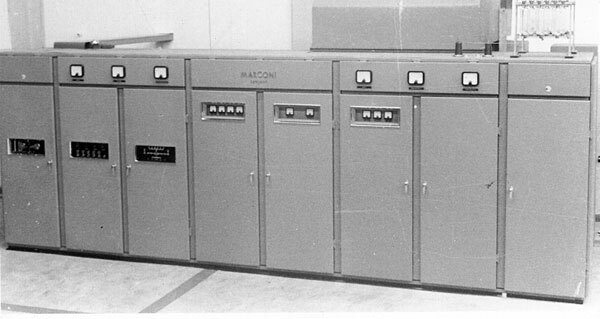 The Marconi HS51 had a rated output of 32 kilowatts PEP on single sideband. 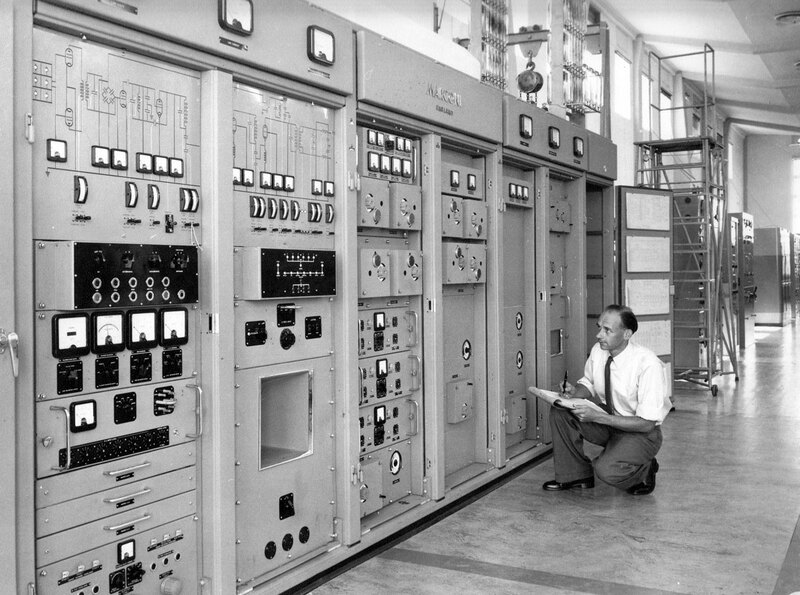 This transmitter occupied considerable floor area and required a separate automatic fire-protected sealed room to house its high current rectifiers and power transformers. Assembling the Marconi HS51 transmitter. Courtesy Jon Asmus. Click to enlarge. 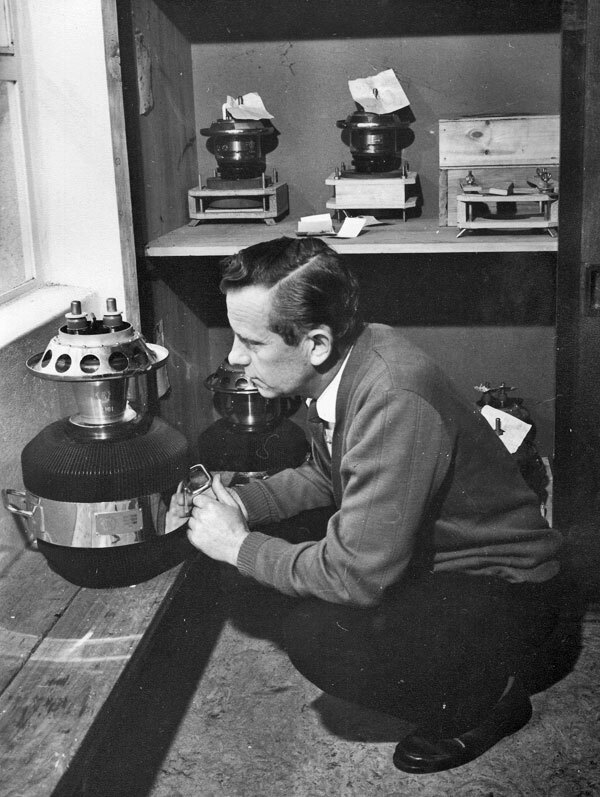 Marconi HS51 transmitter in service. Courtesy Jon Asmus. Click to enlarge. A notable feature of the HS51 transmitter was the final output valve Marconi Type BR161. This impressive looking valve was a forced air-cooled triode fitted with a compact array of welded copper cooling fins and requiring forced air cooling at a volume of 20 cubic feet per minute. This air flow had to be started before the application of any supply voltage to the valve and continued for at least one minute after the supply voltages had been removed. Himatangi technician Brian Gibb surveys the brilliant chrome of a BR161 RF amplifier valve (driver valves can be seen in the background). The two filament studs are evident at the top of the BR161, while the chromed upper heat sink provides the grid connection and the cooling fins clamp with the carrying handles becomes the anode connection. Information from George King. Photo courtesy Jon Asmus. At no time during the switching on process was the filament current to exceed 450 amperes.